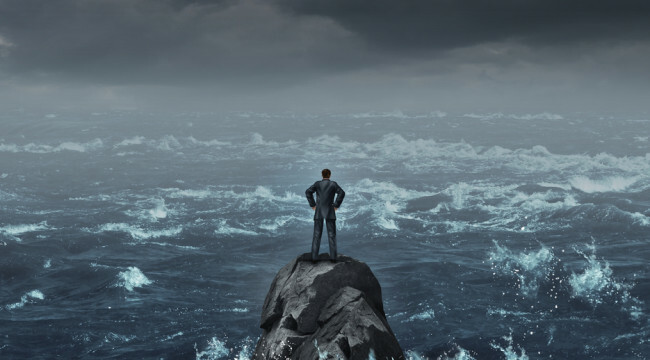 2015: The year faith was lost in central bankers. That’s what we forecast at the start of this year. Unless you live under a rock, you’re aware by now the Federal Reserve stood pat yesterday on interest rates. (If you do live under a rock, we’re sort of envious.) The fed funds rate remains near zero, as it has ever since the Panic of ’08. This morning, we see affirmation of our forecast from many quarters — starting with the establishment financial media. Of course, it’s not only clueless central bankers who are only now figuring this out — as their precious 2% inflation can’t materialize. There’s also the usual lineup of “contrarian” pundits who predicted cheap money would set off hyperinflation. “To have inflation, you need two things,” Jim Rickards explained to me last year. “You need money supply, but you also need velocity. Velocity’s the turnover of money. “So if I go out tonight and I buy a drink at the bar, and I tip the bartender, and the bartender takes a taxicab home, and the taxicab driver puts some gas in his car, that money has a velocity of 3. You’ve got the bartender, the taxicab and the gas station. But if I stay home and watch TV, that money has a velocity of zero. We see that in soft retail sales numbers, and especially in the government’s monthly income-and-spend report: For more than a year, consumer spending has been growing more slowly than personal incomes… and personal incomes are growing at a glacial pace. 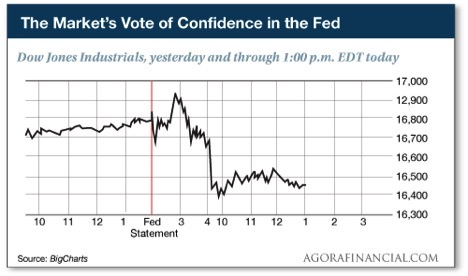 That’s the picture of traders parsing every word of the Fed’s statement, hanging on every word during Janet Yellen’s news conference, and then throwing a tantrum over “uncertainty”. But it didn’t. Sure, the unemployment rate is only a tad above 5%, but even she knows that’s because legions of Americans have given up looking for work. Meanwhile, GDP is anemic and inflation as the Fed defines it is all but nonexistent. If, as Shakespeare said, the past is prologue… now what? Jim’s been on record since late last year — no increase in the fed funds rate during 2015. Not in March, not in June, not in September. And no, not in December either, Janet Yellen’s protestations to the contrary yesterday notwithstanding. Our friend Chuck Butler at EverBank Global Markets made the same prescient call late last year. After suffering through Yellen’s news conference yesterday, he writes: “The Fed chair said that the goings-on in China, the market gyrations, the lack of inflation are their concerns.